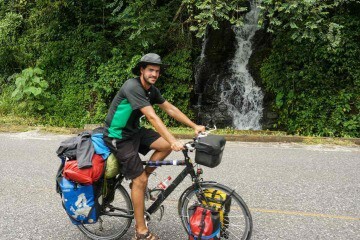 How Do You Shower While Bicycle Touring? Ok. So you travel by bicycle. You sleep in your tent. You cook your meals on your stove. But… how do you shower? This is one of the questions people ask us all the time when we explain our travel style. They think that traveling on a budget means that you have to sacrifice being clean. That is definitely not the case. Although we normally go weeks without a hot shower, we wash ourselves on a daily basis. In Western countries we tend to think you can only wash yourself in a bathroom with a shower or a bath tube. Well, let me tell you that’s certainly not the case in most of the developing countries we’ve visited to date. To wash yourself you only need water and soap. We carry a bar of soap, so we only need to find water. 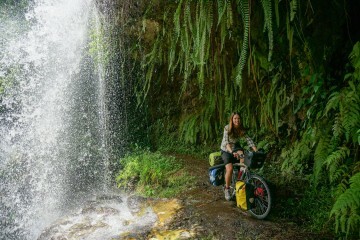 Let me show you the different types of “shower” we use when we travel on our bicycles. Whenever we are looking for a place to camp, having a river nearby is a big plus. 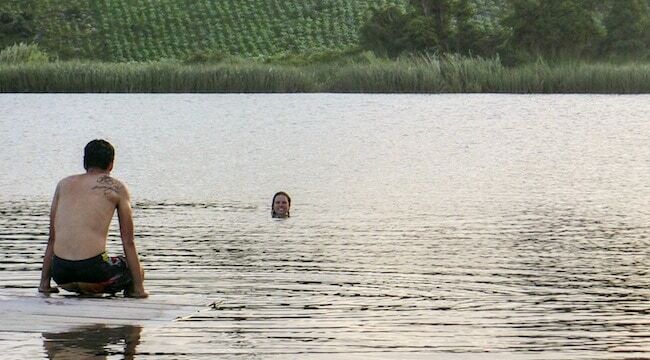 I would even prefer to jump in a lake after a long day of cycling than take a normal shower. Just use biodegradable soap, please. Beaches are one of my favourite spots to camp and shower. I know many of you would tell me that you will be salty after swimming in the ocean. One or two days of a salty shower won’t hurt. After being on the saddle for 5-6 hours a swim in the ocean will feel like heaven. You won’t even question if it’s fresh or salt water, I guarantee it. Depending on the country where you travel, the petrol stations might even have free showers. Being open 24 hours and with security guards, they are a great spot to spend the night (the only downside is that some petrol stations get noisy with big trucks stopping off at night). 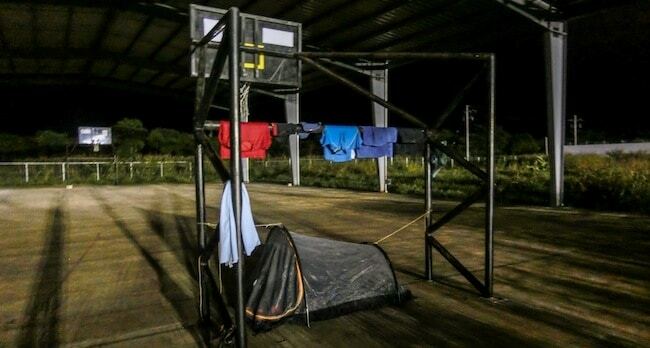 Whenever you are in a small town looking for a place to spend the night, before asking people for a place to put your tent, think that sports courts usually have changing rooms with showers as well. 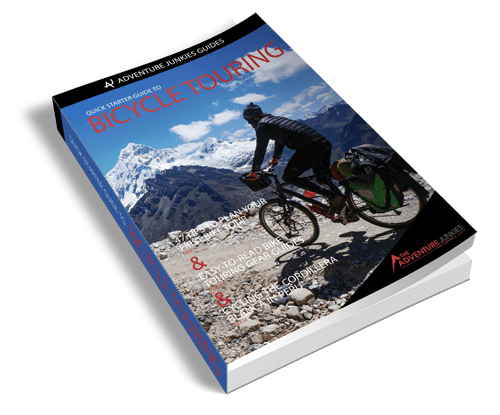 A great combination for bicycle tourers. For the days we can’t find any of the previously mentioned places, we carry shower adaptors for our 10L MSR dromedary bags. You only need to find some water during the afternoon before starting to look for a place to camp. Unless you like toughing it out and go for weeks/months camping, staying with Warmshowers and Couchsurfing hosts or even paying for a room is a great way to “catch up” on showers. They are also the best places to wash your clothes. You never know where you can find an opportunity for a shower. 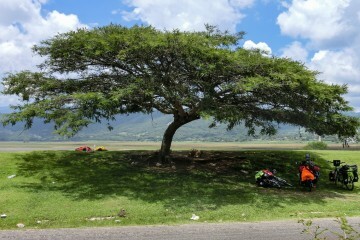 Once, while pedaling in Mexico, we got hit by a tremendous downpour. While we were protecting ourselves from the rain in a restaurant, I just put on my swim shorts and had a improvised shower with the water falling from the roof!